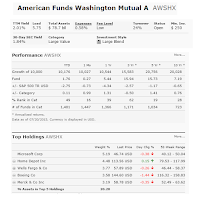 American Funds Washington Mutual A Fund (AWSHX) focuses its investment in established U.S. companies. It is a large value mutual fund. 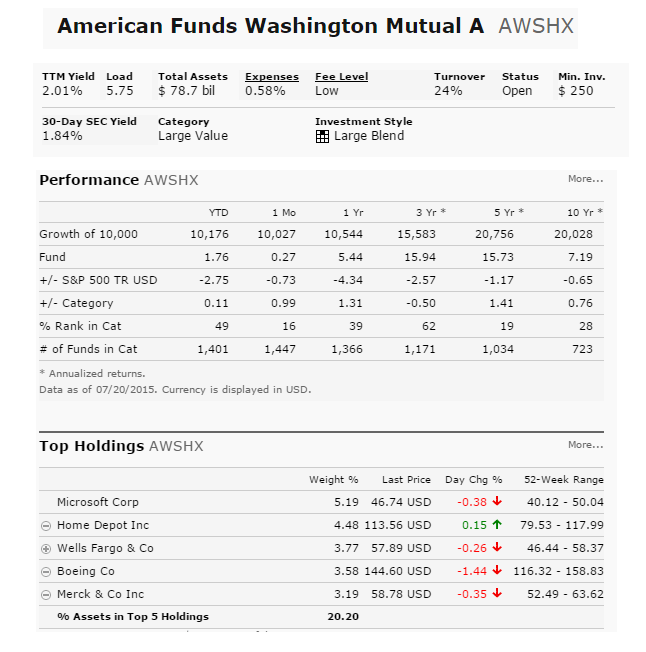 The following American Funds Washington Mutual A fund is among the oldest and popular US stock mutual fund. This us equity fund is also among the largest mutual fund. Details about the fund’s review can be found below. The investment objective of American Funds Washington Mutual A fund is to provide income and to provide an opportunity for growth of principal consistent with sound common stock investing. This US stock fund invests mainly in common stocks of established companies that are listed on New York Stock Exchange (NYSE) and have a strong record of dividends and earnings. James K Dunton is the lead fund’s manager since 1978. This American Funds fund has an annual expense ratio of 0.63%. It also has a front end sales load of 5.75% and 12b1 fee of 0.24%. The total net assets are $46.15 Billion. It currently has a yield of 2.67%. The turnover rate of the portfolio is 25%. This Large Value US Domestic Stock fund is rated with 3 stars rating by Morningstar. Based on load adjusted returns, this fund has return -1.89% over the past one year, and -0.93% over the past three year. The best 1 year total return is in 1997 with 33.29%. You can buy this equity fund from 74 brokerages like UBS Financial Services Inc, JPMorgan, Pershing FundCenter, Merrill Lynch, etc. You will need $250 initial investment for your brokerage account and tax deferred account or IRA. From one account to another, you may find other classes of this American Funds fund such as Class B (Ticker: WSHBX), Class C (Ticker: WSHCX), Class F-1 (Ticker: WSHFX), Class F-2 (Ticker: WMFFX), Class 529-A (CWMAX), Class 529-B (CWMBX), Class 529-C (CWMCX), Class 529-E (CWMEX), and Class 529-F (CWMFX), R1 shares (RWMAX), R2 shares (RWMBX), R3 shares (RWMCX), R4 shares (RWMEX), R5 shares (RWMFX) and R6 shares (RWMGX). The RWMGX fund has an expense ratio of 0.31% and there is no sales load. This R6 shares is also rated with 4 stars rating. In term of risk, Morningstar has a Morningstar risk rating of 2. Per the fund’s prospectus, the investment risks are market risk, investment style risk, management risk, etc. As of October 2011, the fund’s top 10 sectors are Oil, gas & consumable fuels, Pharmaceuticals, Aerospace & defense, Diversified telecommunication services, Commercial banks, Electric utilities, Chemicals, Road & rail, Beverages, and Food products. The top 10 stocks in its holdings are Chevron, Merck, Verizon, Royal Dutch Shell, Johnson & Johnson, Home Depot, Coca-Cola, Kraft foods, McDonald’s, and AT&T.